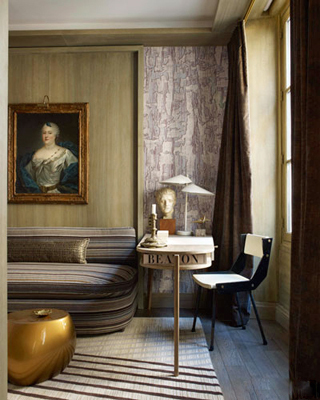 When am I going to stop posting the work of French interior designer JEAN-LOUIS DENIOT? Never! 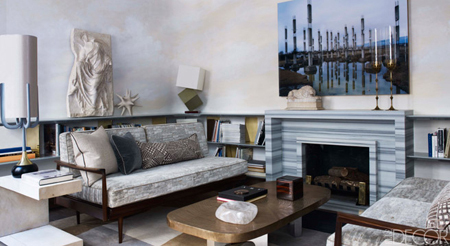 As you know, I featured Jean-Louis’ work in Paris near Saint Sulpice, on Avenue D’Eylau and on Chicago’s Lake Michigan, but his personal hideaway on the Carre Rive Gauche in Paris is my new favorite. 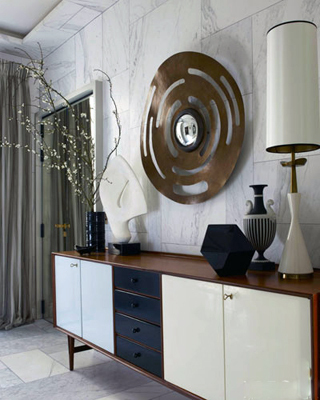 When Jean-Louis first saw the 1200 square feet apartment, it was extremely run down and Jean-Louis knew it would be alot of work, but the end result is classic Deniot–subtle sophistication and oh, so chic! 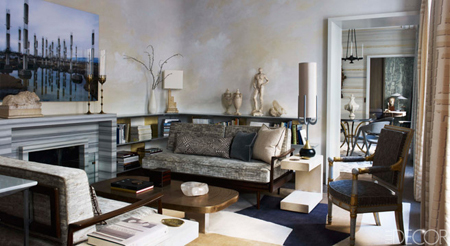 WHAT I LOVE: In the living room, the unexpected trompe l’oeil sky painted on the ceiling and walls. 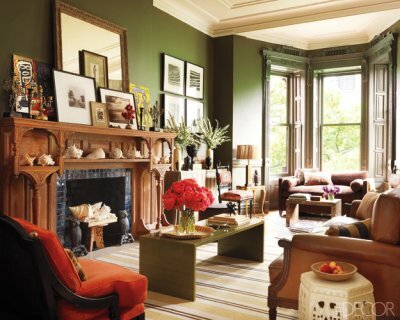 WHAT I LOVE: Also in the living room, the 1950s Knoll sofas + striped marble fireplace mantle. 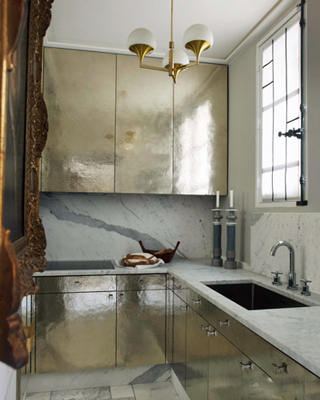 WHAT I LOVE: In the kitchen, the hammered silvered cabinets + the Stilnovo light fixture. 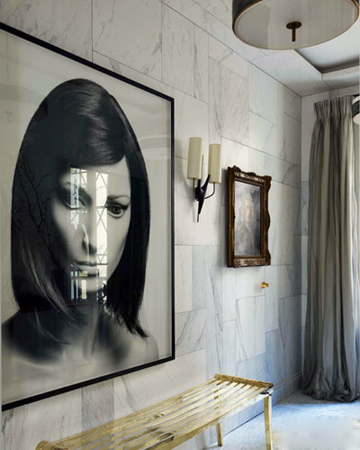 WHAT I LOVE: In the foyer, how the walls are painted to match the marble floors, the Juhl Vodder credenza + Herve van der Straeten mirror. WHAT I LOVE: In the dining room, the 1940s dining table + the 1840s wrought iron chandelier. 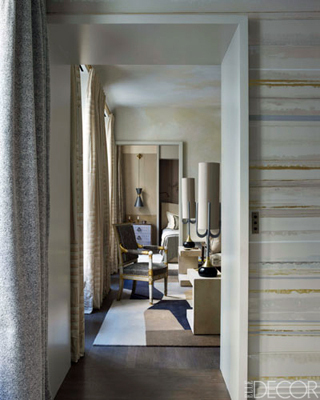 WHAT I LOVE: The continuous flow of serene color palette in various textures from the dining room to master bedroom. 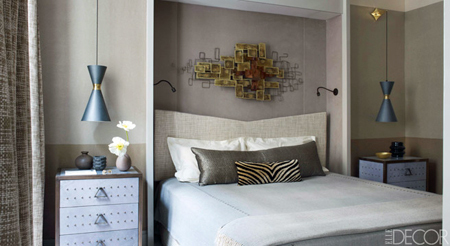 WHAT I LOVE: The suspended Stilnovo light fixtures on either side of the bed + the unique C. Jere by Artisan House wall sculpture. 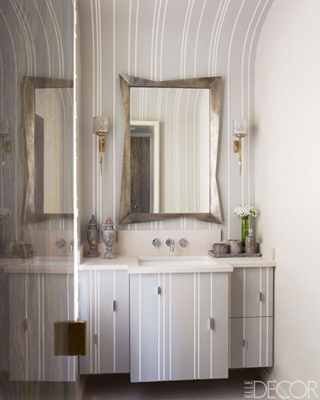 WHAT I LOVE: In a bathroom, how the cabinets are painted the same as the walls. 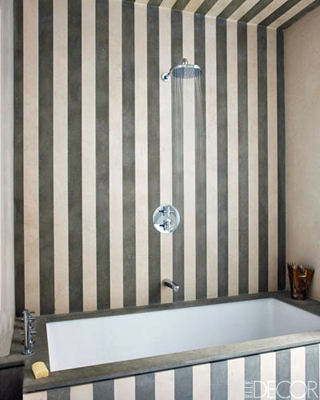 WHAT I LOVE: In a bathroom, how the limestone walls are proportioned with 3.43″ stripes. WHAT I LOVE: In the library, the mix of oak paneling + canvas laser-printed to resemble bark + the curves of the sofa, petite desk and side table.